Hecla Greens Creek Mining Company CEO Phil Baker (holding check) and General Manager Scott Hartman present a check for the Career Pathways in Mining program to UAS Chancellor John Pugh. 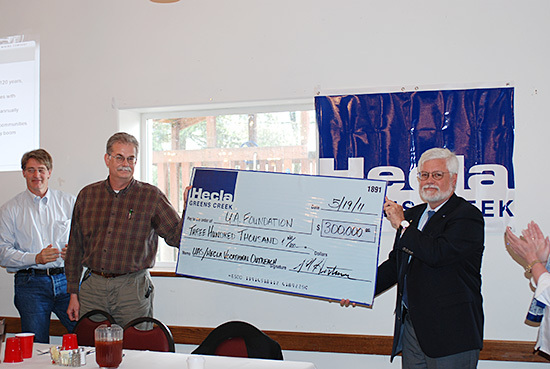 Hecla Greens Creek Mining Company CEO Phil Baker presented a $300K gift to University of Alaska Southeast (UAS) Chancellor John Pugh and the University of Alaska Foundation at the Juneau Chamber luncheon on Thursday, May 19, 2011. The gift will fund a three-year Career Pathways in Mining program at the new UAS Center for Mine Training. The Center is a partnership between UAS and the university’s Mining and Petroleum Training Service (MAPTS). Administered by UAS Career Education, the program will encourage Juneau students to pursue workforce training leading to an Occupational Endorsement for Mine Mechanics and an Associate of Applied Science in Power Technology/Diesel. The gift will also fund scholarships, job shadows, a mining academy and tools and equipment. The goal is a collaborative approach to build a local mining workforce in Southeast Alaska. "We are grateful for the generous donation that will enable UAS to further develop the mine training center program and provide increased opportunities for the citizens of Juneau and Southeast Alaska to prepare for jobs in the mining industry," said UAS Chancellor John Pugh. "We are pleased to partner with the University of Alaska Southeast to develop educational opportunities combined with a career path for the youth of our region," added Scott Hartman, General Manager of Hecla Greens Creek Mining Company. "We look forward to a long and successful affiliation with the University." High school juniors and seniors would be recruited to attend a semester long course entitled Introduction to Mining Operations and Occupations. They would earn UAS credit for this through a dual enrollment agreement. A major focus will be on opportunities for mining careers, safety, and employability skills. Students who complete the Introduction to Mining Operations and Occupations course would be eligible to attend the two-week Hecla Greens Creek Mining Academy. The Academy will include required federal mine safety (MSHA) training and other introductory level material. The next educational experience in the flow is a Job Shadow experience at the Hecla Greens Creek mine. Here, Greens Creek mentors will provide direct supervision, coaching and instruction in various mining operations. Scholarships would then be available at the UAS Center for Mine Training for both the Mine Mechanic and Diesel Occupational Endorsements (2 semesters, 29 credits). Scholarships will also be available for advanced training at UAS in the Associate of Applied Science Power Technology / Diesel Emphasis, requiring 2 additional semesters (60 total credits). The UAS Center for Mine Training is located within the UAS Tech Center along Egan Drive across from JDHS. The Center is the future location of a new state-of-the-art underground mine training simulator, funded in part through efforts of Representative Cathy Munoz. The new training simulator is expected to be operational in time for students to use it in the Hecla Greens Creek academy program. The program is slated to start in the Spring of 2012.